Conchas (pronounce the ch as in chair) are traditional sweet buns from Mexico. Also known as pan dulce, these sweet rolls have a slightly hard crust and a soft,slightly chewy,sweet inner part. Once you take a bite into the crust, it melts like magic in your mouth. Usually eaten for breakfast, these sweet rolls were a delight to prepare. Though I have to master the correct consistency of the sweet pastry(paste, topping) on top, the taste was heavenly. 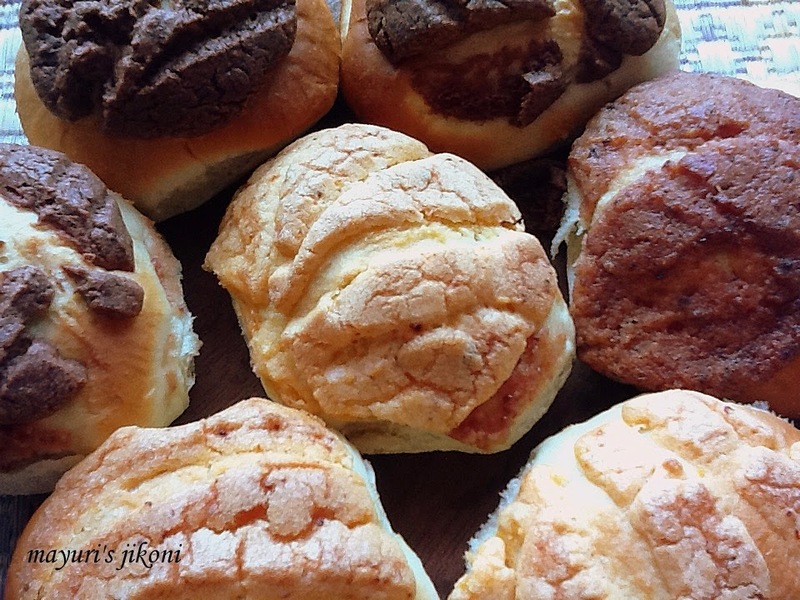 These sweet buns are known as conchas because of the shell like shape of the pastry created either by making the lines with a sharp knife or with a conchas cutter. I recently joined the baking eggless group started by Gayathri of Gayathri’s cook spot. I love baking and what better platform to try out various challenges and learn new things? Every month the members are given a recipe which we have to bake without eggs. Joining this group just a few days ago and my first challenge was Conchas. Conchas?? I thought,never heard of this. It was an exciting journey through the web to discover a new sweet bread. Most of the recipes I came across used eggs, so how do I avoid egg and make it soft as described by many bakers and bloggers. As I readily use yogurt to prepare eggless muffins and cakes I thought of using yogurt. The second exciting part of making these conchas was to use a starter sponge, as the recipe sent to us by Gayathri suggested. Every time I bake bread, I think that I should use a starter sponge but never really got down to the task. Always took the quick way out. Now I am going to make it a habit to use a starter sponge, biga or poolish as its called. This is what gives the bread a nice soft but slightly chew texture. Check out weekend bakery.com for information on starters. I made the pastry topping in three different flavours, chocolate and cinnamon, cranberries and orange peel. The pastry topping didn’t come out the way it should, presentation wise but tasted yummy. On one of the buns, its managed to slide off to the side, on some the shell pattern didn’t come out as I would like. But overall attempt, I was pretty pleased. I got so busy and involved in making the conchas that I forgot to take the photos of every stage. I usually don’t take so many photos but the end product. Well, hopefully I will remember next time. This is a recipe I will try out again and again. Mix yogurt and warm water. Mix flour, sugar and yeast in a bowl. Add the yogurt mixture to the flour and mix well. Cover the bowl with cling film and let it ferment in a warm place for nearly 1½ hours or until it is double in volume. Mix flour, yeast, butter and salt in a bowl. Add all of the sponge, yogurt and water and form a dough. Turn the dough onto a floured board or surface and knead for 10 minutes till it becomes soft and silky. Add the sugar and knead for a further 5 minutes. Grease the bowl and dough ball with a bit of butter. Place the dough in the bowl. Cover and let it ferment for 30 minutes. Place the dough in the refrigerator for 8 to 16 hours or overnight. Process the dried cranberries and sugar in a coffee grinder. Sieve sugar into a bowl. Add butter and mix well and form a paste. Divide the paste into 3 parts or according to the number of flavours you are making. To the first part of the paste add cocoa powder and cinnamon powder and mix well. If it appears slightly dry add a drop or two of milk. To the second part of the dough add the cranberry paste and mix well. To the third part add the orange zest and orange colour. Mix well. Remove the dough from the refrigerator and knead it gently on a floured surface. Divide it into 8 parts and roll each part into a ball. Grease baking sheets and place the balls at a distance of 3 inches apart. Divide the paste or topping according to the number of buns. I used 3 parts of the cocoa one, 3 parts of the orange one and 2 parts of the cranberry one. Take one part of the topping and press it into a 3 inch disc using your hands. Place it on top of the dough ball and slightly press it down with your hand. Repeat the procedure with the rest of the topping. Take a sharp knife and cut shell like patterns on the paste or pastry. Place the dough in a warm place to rise till it becomes double in size. Mine took about 45 minutes. Place the trays in the oven and bake for 15 minutes. Change the trays, placing the top on at the bottom and the bottom one on the top. Bake further for 5 minutes or until the topping appears set. Remove the buns from the tray and place them on a wire rack to cool. Don’t let the starter over ferment, otherwise the texture and taste of the bread will be altered. The amount of water required for the final dough will depend on the type of flour used. Some flours absorb more water than others. If the paste, topping appears dry like mine did, add a few drops of water or milk. If the paste, topping is sticky, work with some flour. Add flavours of your choice.